Goodbye primary colors and hello neutral tones. Neutral tones like whites, greys, tans and off-whites are all the rage in countertops. They give an illusion of a more open space in your kitchen. It’s perfect if you have a smaller or gallery style kitchen. Natural stone is a great option to incorporate into your kitchen design because they come in a range of earthy and neutral tones. One great stone material option is quartz, it comes in lighter colors like soft grays, dull browns and off-whites and is perfect for kitchens that see a lot of traffic and work. No one likes doing dishes, and if you do well, that’s awesome! However, most people do not find it entertaining to wash dishes every day. Lucky for all of us, integrated sinks are huge trend right now! You can hide away your sink and dishes seamlessly with your countertops material. Integrated sinks are a great option because it will match your countertop and is extremely durable. Natural stone materials like marble and quartz are particularly durable and can withstand the heat of the kitchen. Marble is taking over editorial magazine kitchen and about every celebrity kitchen. Have you seen the Kardashians’ marble filled kitchens, they’re breathtaking! 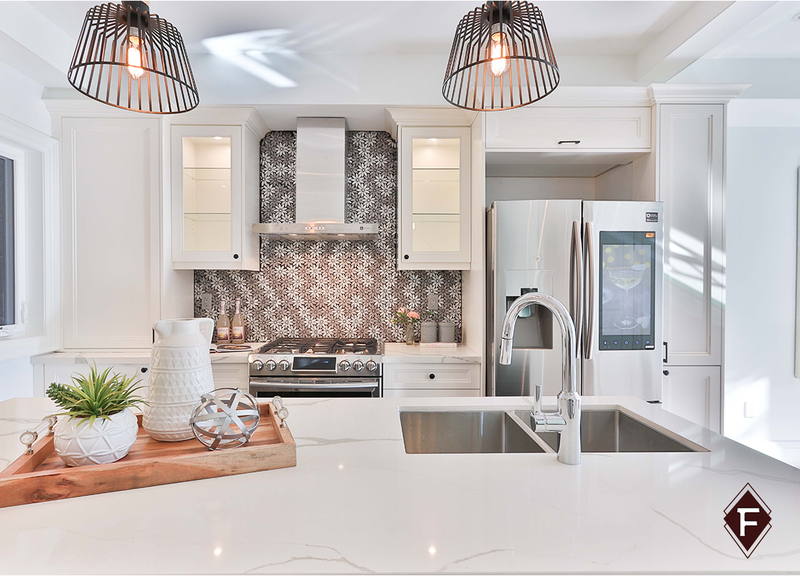 The newest trend is incorporating the classic and timeless marble countertops and backsplashes with industrial cabinets. The natural pattern of the marble surface creates a dramatic pattern that becomes a natural focal point. Some homeowners prefer to dabble into incorporating different kind of materials kitchen designs. You have started to see kitchen designs that integrate two different type of stone materials into the kitchen countertops. For example, homeowners will have a classic granite countertop on their kitchen cabinets but incorporate a wood or steel countertop on their kitchen island. The mixing of materials gives your kitchen a much more modern and eclectic style. We are not talking about poke-a-dot and zig-a-zags but a natural stone pattern. Natural stone with a much more veiny and detailed look is being chosen over quiet design. The more veiny look will give your kitchen that unique style. The natural pattern of stone will break down the harsh lines of your kitchen. It can soften the look of your kitchen without out dating it. Quartz is one of the most popular options because it naturally looks less perfect and symmetrical pattern.